January 14th. Teeny Tiny Worlds terrarium class! We like to put our own spin on things around the kQ. studio so our Teeny Tiny Worlds are part terrarium/ part diorama! The basics of terrarium building will be reviewed and then we set you loose to use every creative bone in your body in making your very own Teeny Tiny World! Air plants, echevaria, both live & artificial elements & all the fixin’s will be available at the terrarium beauty bar… make your selections & create your world! This class is great for kids! We can also schedule small groups for a party or event. Contact for further info! 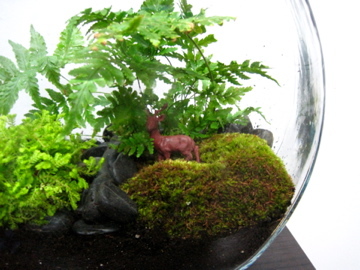 Class fee is based upon number of terrariums built during session. Pre Registration is helpful when planning supplies. There will be a selection of container styles to choose from. Find out more information or sign up with one easy click HERE!